The Summer Olympic Games will take place from July 27 to August 12, 2012 in London, England. But just don’t let the kids sit and watch, why not hold your own Mini-Olympics? Involve them in all the fun physical activity by staging a kid-friendly version on the playground or in your own backyard. In setting up a developmentally appropriate Mini-Olympic Day for young children remember to provide opportunities for every child to voluntarily choose from a variety of Olympic-style events. Set up stations where children can move from one event to another at their own pace and rate. Remind the children that finishing first is not as important as having a good time. The emphasis is more on fun than on skill. Before starting any of the events, lead the children from station to station and explain and/or demonstrate the “how-to’s” or challenges of the event at each station. To get started, divide the class or group into equal numbers according to the number of stations set up. This eliminates children standing in a long line and waiting for their turn. For example, if you have 6 stations and 24 children, you would put 4 kids are each station. With a blow of a whistle (WHIS), children begin the physical challenge of the event. When they have completed that event they move on the next one and so forth until they have completed all the stations. And, of course, they can go through them again and again! • Target Toss (Archery): Draw a large circle on the asphalt using sidewalk chalk (SIDEWALK). Make smaller circles or place shape spots (SHSPOT) inside the large circle as targets. The players take turns tossing beanbags from a specified throwing line until they hit a target. • Running Races (Track and Field): Set up start and finish lines about 15-30 feet apart. Challenge the racers to run, walk backwards, gallop, crab walk or creep on hands and knees to get from the start line to the finish line. • Throwing for Distance (Shot Put): Use a small sensory ball (SENBALL) or a tightly wrapped ball of aluminum foil for your makeshift shot put. Show the kids how to hold the ball near the ear and launch it forward by extending the arm. They cannot move their feet. How far can they throw the ball? • Jumping (Equestrian Jumping): Set up two cones fifteen feet apart. Have kids “saddle up” a ball hopper (horse), hold the handle and jump to the opposite cone and back again. • Kicking (Soccer): Set up a soccer goal (GOAL) a least fifteen feet from a specified kicking line. Players stand behind the line and kick a soccer ball (SOC) into the goal. • Canoe Race (Canoeing and Kayaking): Set up five cones for children to weave through as they ride (sitting, kneeling or prone position) their scooter board or roller board kayak or canoe. It doesn’t matter if there are no medals distributed for this Summer Mini-Olympics. What’s really important is how much fun everyone had as they played together and cheered each other on. Remember, the Olympics are a celebration of friendship, unity and peace! • Roll down a grassy hill. No hill? Pull out a tumbling mat and have children roll like a log from one end to the other. • Pull out the parachute and move it like the wind, gently blowing (slow and soft movements up and down) or create strong gusty gales (fast and quick shaking movements). When the wind blows in the autumn, leaves fall from the trees, twirling and dancing in the wind. Place some real leaves on the parachute and have the children shake the parachute accordingly as you describe how the wind is blowing, either gently or more briskly. After a big, stormy strong wind the leaves have all scattered. Children will have fun as they “rake” up the leaves that have blown (shaken) off of the parachute. • Pick up a stick, find a rock, climb a tree, look for bugs, smell the flowers, collect leaves, go on a nature hike, dig in the dirt, jump in a puddle, have fun in the mud. • Play “I Spy Outside.” Take turns saying, “I spy something _____” and then together run to that object. • Move like the animals — fly like a bird, slither like a snake, scamper like a squirrel, walk like a bear, jump like a frog or a rabbit. 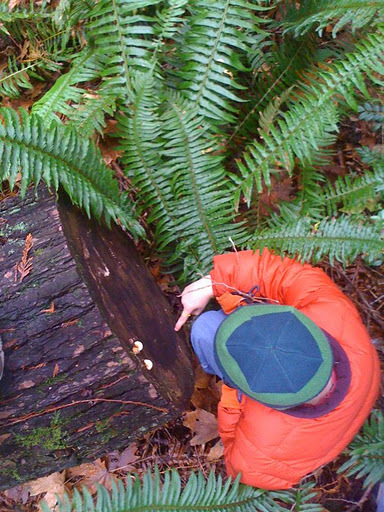 • Set up a Nature Scavenger Hunt. After assessing your playground or yard, make a list of things that the children have to find. The list might include an acorn, a Y-shaped twig, a pinecone, a clover, a pillbug, a gray rock, or whatever else might be in the immediate environment. Naturally, the list will depend on the season and the age of the hunters. • Make a Sidewalk Chalk Obstacle Course. Using sidewalk chalk create a maze for children to follow using different movement skills. Draw — straight lines, curvy roads, zig-zag paths for children to walk on; lily pads to frog jump onto; shapes to hop into; rivers to cross; and rainbows to jump over. Make nature and the outdoors a part of your teaching. Lead the way and be the first to say, “Let’s Go Outside & Play! Tumbling and Wrestling and Roughhousing, Oh My! At the signal, ringing of the triangle or bell, the action begins as Sally and A.J. tumble and wrestle each other. When one of the pair is off the mat, the action ceases. It’s now time for another pair of children to take their places on the mat, facing each other on their hands and knees. “Roughhousing,” as we called it, was always a positive part of my preschool curriculum. On those days when we were pent up inside due to inclement weather or when there was a buzz of high energy in the room, I would take out the tumbling mat, place it in the middle of the circle time rug or carpet, and announce that it was time for roughhousing. Children who wanted to participate would sit around the edge of the mat and talk with their friends who had joined them about who was going to wrestle with whom (participation was voluntary and children could pick their own partners). An adult was always present. We would go over the rules and demonstrate the difference between a hit or punch, with a closed fist, and a soft push with an open palm or soft shove with a shoulder. There is a world of difference and it is necessary to illustrate it. Usually, I would ask one of the children or one of my colleagues to demonstrate with me so that I could visually show the group what is acceptable and what is not appropriate behavior. The children would pick a partner, usually someone who matched their own weight and height, and those two would take their place on each half of the mat. I always had the children start on the ground at the same level. If you feel an activity like this might be appropriate for the children in your care or classroom, it’s important to note that play that involves tumbling and roughhousing is meant to be active and fun for both participants, not a time to knock each other down or intentionally hurt each other. There are differences between aggression (hostile, injurious or destructive behavior) and roughhousing (rowdy, uproarious play or behavior). When aggressive, children frown and fixate on hurting the other child. In rough and tumble play, children willingly participate while smiling and laughing. At the ring of the bell they begin and at the next ring they end (when one of the children is off the mat). The entire “match” lasts between 30 – 90 seconds. The children return to their places around the edge of the mat, ready to wrestle with another friend. After 15-20 minutes, we would be done and the mat was put away. Children who learn the difference between play wrestling/tumbling and aggressive fighting also develop important social skills. It can, over time, improve a child’s ability to solve problems that arise in social situations — the give-and-take mimics successful social conversations and interactions. Physically, children are benefiting from the intense physical exertion of rough and tumble play which supports cardiovascular health. Tumbling and wrestling can also help develop gross motor coordination, spatial orientation, directionality, laterality, body image, visual motor control, body awareness and eye hand coordination. After active play such as wrestling/tumbling, children are much more able to sit still and concentrate because they’ve been able to participate in some physical activity. Many boys and girls enjoy the experience of the big-body play that tumbling/wrestling offers. The preschool period is a critical period for children to develop both physically and emotionally. Tumbling and wrestling for preschoolers can indeed be developmentally appropriate and if you feel it can be appropriate for your youngsters, I encourage you to give it a try! A snow angel is created by lying down on your back in powdery snow and moving your outstretched arms on the snow, going from head to waist in a sweeping motion while also moving your legs apart as far as they will go and then bringing them back together. Keep repeating these motions (it’s like doing jumping jacks while lying on your back) until a large enough indentation has been made. You’ll see the shape of an angel or fairy (a body with a skirt and wings) when you stand up. We would try to make several angels in the snow, always looking for the perfect angel (one without foot prints or handprints in the middle of it). I didn’t grow up having Liquid Watercolor but wouldn’t it be fun to put some Liquid Watercolor™ into a spray bottle and spray the finished angels different colors to make them stand out? The best news is that kids don’t have to live in snow country in order to make snow angels/fairies. These can be made on tall grass, in sand, and invisible ones can even be made on classroom or home carpets or on tumbling mat . 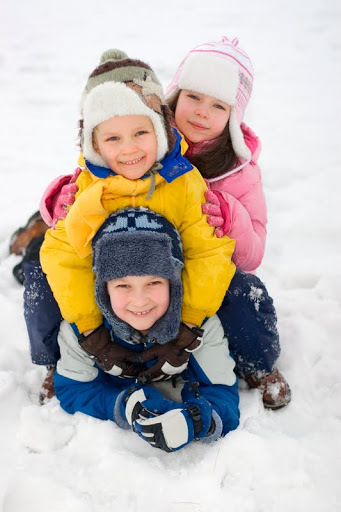 Making snow angels can be a good cool-down activity to conduct after active play as it helps the heart and body to return to its normal resting state. To create a calm and relaxed mood, a teacher or caregiver can put a CD such as Putamayo “Dreamland” CD in the CD Player. As the soothing music plays, lead the children in the activity of angels in the snow. For the developing young child, this activity may be harder to do than it looks. 1.Child lies down on back. or carpet, the child opens and closes legs. Arms are kept down to sides of body. 3.Child practices opening and closing legs, keeping legs in contact with floor. 4.Once a smooth, sustained legs-apart, legs-together movement is mastered, instruct the child to move arms away from sides of body to shoulder height and then return them to side of body, keeping arms in constant contact with floor. 5.Now instruct the child to open and close legs while moving arms. 6.Emphasize that the arms and legs stay in touch with the surface of the floor while there is movement.